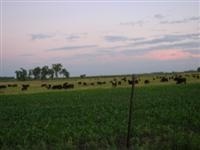 New in 2009, we are offering meat sales from our farm-raised Angus cattle. If you are accustomed to the typical grocery store meat, you will be in for a taste treat if you try out home-grown, corn-fed Angus beef. Our family takes pride in raising quality beef on our family farm for generations. The meat may be purchased by the quarter, half, or whole animal. With a typical half animal, you would get about 300 lbs of meat. The meat is sold by the hanging weight of the animal and is processed in Howard, South Dakota. Contact us at 483-3331 or 480-0418 for more information.